Imperial County is a largish county in the southeastern corner of California. It was the final county formed in California, created in 1907 from the southeastern quadrant of then-existing Riverside County. The county was organized in the wake of disastrous floods and botched water-control projects along the Colorado River in 1905 and 1907 that diverted waters into the then-dry Salton Sink and created the Salton Sea. The Salton Sea remains the heart and soul of Imperial County (over 2/3 of the Sea are within Imperial; the north end is in Riverside County). Today the Imperial Valley at the south end of the Sea is a rapidly growing agricultural region. Fields around the Sea, small marshy ponds (Finney Lake, Ramer Lake), and the shore and Sea itself, attract a myriad of waterbirds, including a very long list of rarities. Now famous birding spots include the Salton Sea NWR, Red Hill Marina, and Salton City. Where not irrigated, most of Imperial County is barren, sandy, low desert, stretching east to the State's border along the Colorado River. 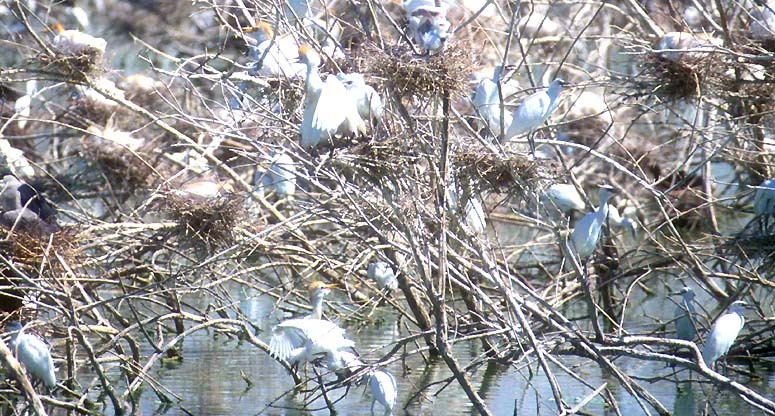 Imperial Dam and nearby West Pond are important bird locales on the River. Efforts to stabilize the Salton Sea, and deal with a host of problems ranging from pollution to salt saturation, face officials and environmentalists today. Yet the Sea — hot humid, and stinky — remains a fabulous birding spot. County birding statistics and links are on Joe Morlan's site. 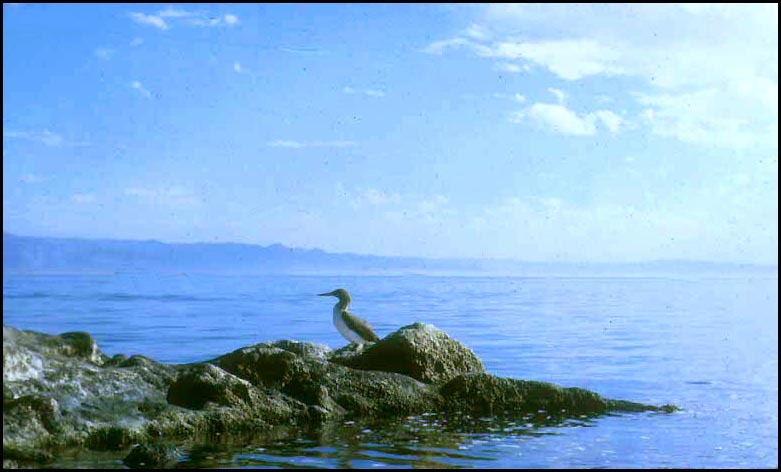 Birds of the Salton Sea: Status, Biogeography, and Ecology (2002), by M.A. Patten, Guy McCaskie, and Philip Unitt, covers the status and distribution of all Salton Sea birds in both Riverside and Imperial counties. 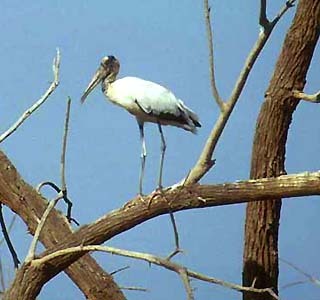 Similar coverage for birds along the lower Colorado River — including San Bernardino, Riverside, and Imperial counties — is in Rosenberg, Ohmart, Hunter, and Anderson's 1991 Birds of the Lower Colorado River Valley, published by the University of Arizona Press (it also covers the AZ side of the river). For Imperial County I have chosen one of my oldest bird photos, and still among my favorites. It is of a Blue-footed Booby standing on the shores of the Salton Sea, and it captures a bit of the essence of the Sea. This was the first rarity that I chased in California. A few friends and I packed into my little red VW 'bug' and drove all night from Napa County (where I was a freshman in college) to Salton City in hopes of seeing a booby. We found this one — and two others that were dead on the shore. These were bagged and took back to Pacific Union College, where I skinned and stuffed them as specimens that are held by the little Natural History museum there today. 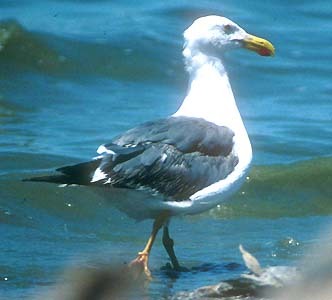 Other specialties of the Salton Sea are shown below: an adult Yellow-footed Gull (8 July 2000 at south end of Salton Sea) and a Wood Stork (15 July 1995 at the Wister Unit of Salton Sea NWR, near Niland). The two photos below contrast the cycles of abundance is living and dying at the Salton Sea: the Cattle & Snowy Egret heronry at Ramer Lake (27 June 2003) and dead fish among trash (beer can, discarded sandal) at the New River mouth (May 1983).